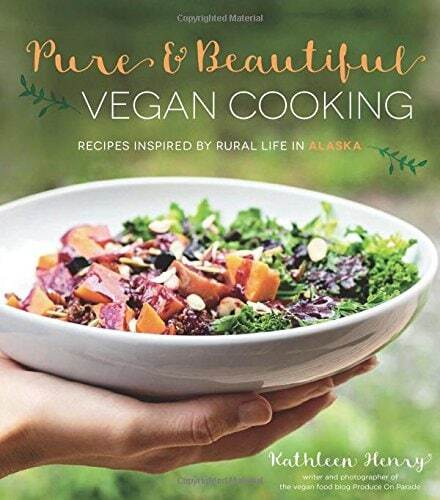 Today I am reviewing the cookbook, Pure & Beautiful Vegan Cooking – Recipes Inspired by Rural Life in Alaska by Kathleen Henry of the blog Produce on Parade. 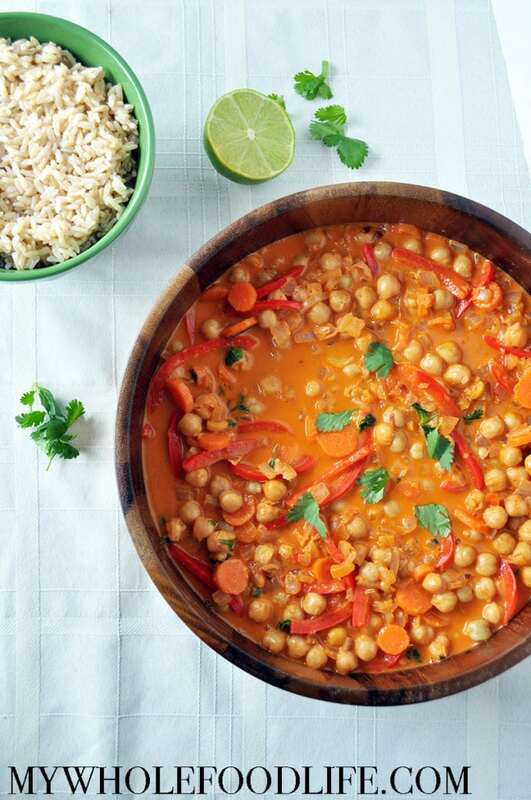 I will be sharing her Thai Chickpea Curry recipe as well. It’s so delicious!! It’s very easy to navigate with lots of beautiful photos throughout. Immediately, the Chickpea Thai Curry caught my eye. This dish is absolutely divine. Mildly sweet from the peppers and coconut milk, and slightly spicy from the Thai curry paste and red pepper flakes. Some of the other dishes I look forward to trying are: Wild Blueberry, Rhubarb & Hazelnut Crisp, Roasted Veggie Lentil Salad with Avocado Balsamic Dressing and the Caramel Banana-Oat Pancakes. Yum!! This curry is packed with flavor! In a small saucepan, add the rice and water. Bring to a boil, then cover, turn down and simmer until all the liquid is absorbed. About 15-20 minutes. Once the rice is done, remove it from the heat and set aside. In a large saute pan, add the coconut oil, garlic and onion. Cook on medium low heat for about 4 minutes. Stir in the curry paste and ginger, then add the carrots and bell pepper. Saute for about 5 minutes, then add the remaining ingredients, except the lime juice and cilantro. Stir well to combine and increase the heat to medium. Allow to bubble gently for about 8-10 minutes, stirring occasionally, until the carrots are tender. Remove from heat and stir in the lime juice and cilantro. To serve, fill serving bowls with a little rice, then pour the curry on top. Disclaimer: I was given a free copy of this book in exchange for an honest review. All opinions are my own. You had me at curry! This looks and sounds delicious. Looks really yummy, but cannot eat any fat whatsoever... any ideas how to compensate for the coconut milk? Can you use the low fat coconut milk? Thank you Shirley! T = tablespoon and tsp = teaspoon. Enjoy the recipe! Tell us how to make it in the instant pot, please. Delicious but too much liquid. Next time I won't add the water! Is the Thia Red Curry really spicy. I love spicy, but, since I've gotten older my mouth just can't handle it anymore. If it is, is their a milder version? Is there a substitute? Is there a Brand you like? Thank you. Red curry isn't too spicy. I can't handle super spicy foods and I can eat this.